The Notre Dame Cathedral in Paris is more than just a Christian temple located in the center of the French capital. Although they are still about to calibrate the damages of the fire registered this Monday, the flames can put in play many things. Although it is also common to mention the cathedral of Reims, Notre Dame finished configuring the French Gothic canon that would end up spreading throughout much of Europe, including Spain. His footprint is palpable in León, Burgos and Cuenca, among other cathedrals. The vault of crucería , one of the main achievements of the Gothic, reached in Paris levels of sophistication never seen. Thanks to it, the cathedrals rose in height and the walls lost their mission sustendora, which favored the appearance of stained glass. Notre Dame is located on the island of the Cité , in the middle of the Seine, the place where medieval Paris was founded, at the very center of Roman Lutetia. Joined to the rest of Paris by the Pont Neuf, it is impossible to avoid going through it and contemplate its facade in the wandering through the center of the town. 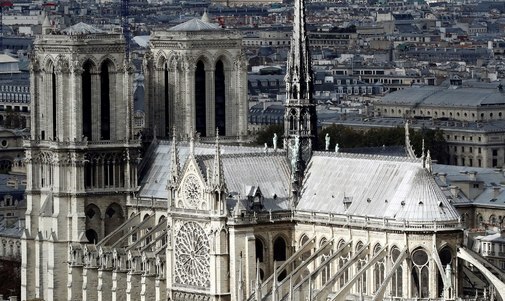 With more than 10 million visitors , the Parisian cathedral is the favorite place for tourists visiting France. This has led to numerous restorations and adaptations of the surrounding space to accommodate the masses. In addition to the architectural value of the building, Notre Dame treasures an important sculptural legacy on the covers and also on the heights, in gargoyles with chimera and estirge forms. Quasimodo moves precisely between gargoyles, the hunchbacked protagonist of 'Our Lady of Paris', the novel by Victor Hugo of 1831 that he met, a century and a half later, an animated adaptation by the Disney factory. Eugène Viollet-le-Duc opened the way to the restoration of old buildings thanks to his work at Notre Dame, which served as a model for other reforms throughout the 19th century. The French Revolution left significant damage to the building, due to the process of desacralization and pillage suffered at the end of the 18th century. In addition to being a religious and cultural temple, the Parisian cathedral is also a symbol of the Resistance against the Nazi invasion, in World War II. In front of the images of Hitler next to the Eiffel Tower or the troops of the Third Reich passing through the Arc de Triomphe, the image of the American soldiers liberating Paris was contrasted, with the two Gothic towers framing the scene. At Notre Dame, music has always played an important role. Starting with the bells, the largest of which (called Emmanuel) weighs 13 tons and has a diameter of 260 centimeters. In the interior, its organ of about 8,000 tubes has been guarded by illustrious musicians, such as Jean-Pierre Leguay. Although the damages are limited only to the cover and the needle, it seems unlikely that the valuable stained glass windows, especially those of the rosettes have remained undamaged, due to the high temperatures. The southern rosette, 19 meters in diameter, dates from the time of Louis IX (1226-1270). MusicSr. Chinarro: "I enjoy the part of music more because I know less"
Sabina Pons "Parents are very demanding and that is incompatible with childhood"
LiteraturaJorge Herralde: "The large publishing groups do not build a catalog, they buy it"